AUGUSTA, GA.—In what was anticipated as a major showdown between the world ranked number two and three players turned out to be a continuation of what’s been happening at The Masters since the 2015 event, Jordan Spieth sits atop the leaderboard—although precariously. The defending champion heads into Sunday’s final round with a one shot lead. The 22-year-old Texan did set a new standard for his ongoing commanding presence at Augusta, now seven consecutive rounds in which he has held the lead outright at The Masters. But, just when it seemed Spieth had recovered from a mid-round double-bogey at the ultra-demanding par-4 11th, with three birdies in a four-hole stretch, he concluded the round with sloppy play at the 17th and 18th with a bogey double-bogey finish respectively and concluding the day’s play with a one-over-par 73 and 213 total for the championship. What had been a four-shot lead with just two holes to play has now provided hope to an array of competitors who can still reap the ultimate prize of a Masters green jacket. Six golfers shot rounds under par during the 3rd round—double the amount that did similarly on the 2nd round. But only Kaufman—playing in his first Masters—broke 70, the first since Thursday’s opening round. Once again steady breezes from the northwest continued to thwart the world’s best players and often times had many simply shaking their head in utter disbelief on their inability to make any headway. The pairing of Spieth with Rory McIlroy had many abuzz with the possibilities of a slugfest between the two titans who had never previously been paired together in the final two rounds of a major championship. The reality was far different. McIlroy’s normal strength in demonstrating a solid tee game was not evident and combined with a balky putter led to a two-over-par 38 on the outward nine. Complicating matters for the two superstar players was both making double-bogey six at Augusta’s most demanding hole—the par-4 11th. 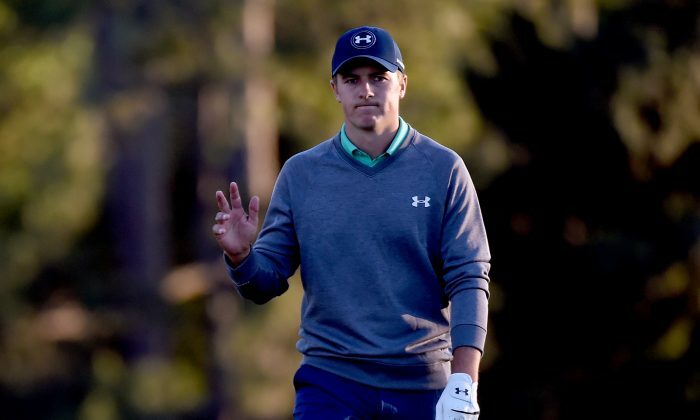 Spieth was able to demonstrate a quick bounce back with a barrage of birdies over the next four holes that followed. However, McIlroy was unable to register a single birdie during the round and his Saturday meltdown adds to the scar tissue the Northern Irishman has experienced at Augusta in his search for the final major to become just the sixth golfer to have accomplished a career Grand Slam club. Nonetheless, Rory is still just five shots from the lead and with a stellar final round Sunday can still be a factor if all breaks well for him. The youth movement of Spieth and Kaufman at the top of the leaderboard was superbly counter-balanced with the likes of two-time Masters champion Bernhard Langer. Playing with the world number one player Jason Day, the 58-year-old German played brilliantly posting a two-under-par 70 marred only by a closing bogey at the final hole. Should Langer win the event he would become the oldest player to have ever won a major—far surpassing the existing record of 48 years old by Julius Boros when winning the 1968 PGA Championship. Langer is tied for 3rd with Japan’s Hideki Matsuyama at -1 for the championship. One stroke further back at even par is Day, Dustin Johnson and Englishman Danny Willett who share 5th. Day and Johnson will be paired together in the 3rd to last grouping. Ten players are within four shots of the lead and with weather conditions forecasted to be less turbulent the possibility of someone breaking from the pack does improve. Masters officials will also have to decide how to set-up the course for the concluding round, whether pin placements are positioned in a way that provides greater elasticity for scoring. Spieth will sleep on a lead that could have been even greater for him and harder for his pursuers to overcome. A win Sunday means Jordan will have won his 3rd major title at such a young age and he would also join an elite club of just three other golfers—Jack Nicklaus, Nick Faldo and Tiger Woods who have successfully defended their title at Augusta. But for Spieth the mental strength to push aside his weak finish to the 3rd round will be a major test. Last year’s coronation for Jordan came in a far different fashion when tying the championship record shared by Woods at 270 for four rounds. This year’s winner will not be anywhere near that total. The scrum that has been this year’s Masters has inflicted a heavy duty mental strain on the players. For Jordan Spieth the ride to a second straight title has been magical thus far. Sunday final rounds at Augusta often spotlight those who embrace that challenge and those who slink away overwhelmed by the moment. Jordan Spieth has demonstrated a resolve not been seen since the heyday of Tiger Woods when he entered professional golf with his first Masters win in 1997. The stakes are high and a green jacket awaits one man. The Sunday final round is now upon us.